It’s amazing what a different a clean, organized space makes in my emotional well-being. 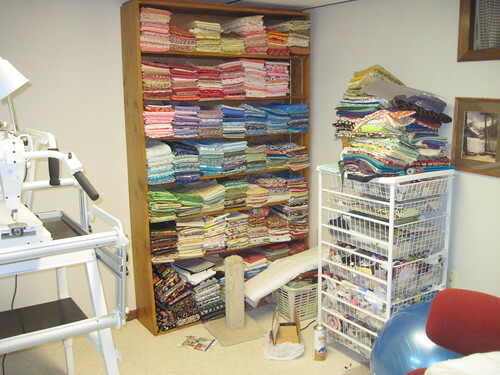 Here are photos of the fabric stash area before moving it. This is by no means the extent of the stash, just the largest portion of it. 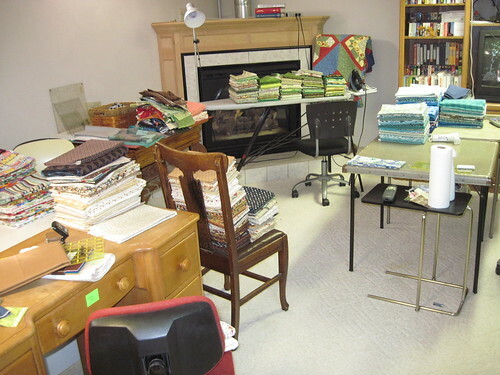 There were also several large wire bins overflowing with scraps and two totes of fat quarters stashed in the back room. Notice the balance ball? Never use it. 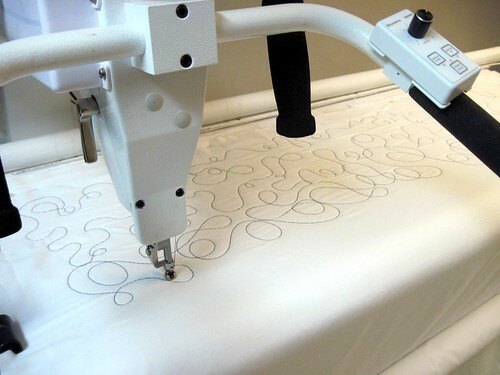 Three weeks in and I haven’t used the new quilting machine. The pattern and spray starch on the floor? Never use them. Buttercup doesn’t even use the scratching post. 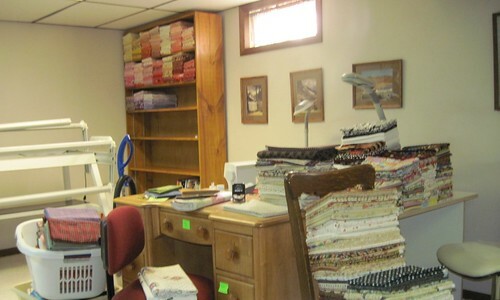 See that enormous pile of fabric on top of the wire drawer unit? It’s so heavy that the plastic top has sagged so I can’t open the top drawer. Pitiful. The larger pieces are all folded uniformly, sorted by color and value, and placed neatly on the shelves. The dresser next to the bookshelf is topped by totes full of scraps, also sorted by color. 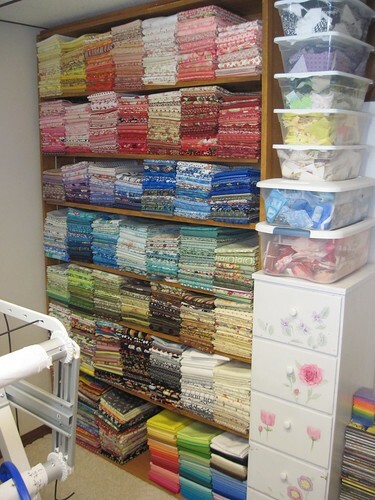 Are fat quarters and “large” small pieces of fabric, also sorted by color. 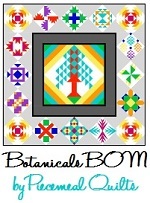 Basically this is anything more than 6″ wide and less than 1/2 yard. This is the length of the room from one end. There’s more space around the corner to the right at the far end. 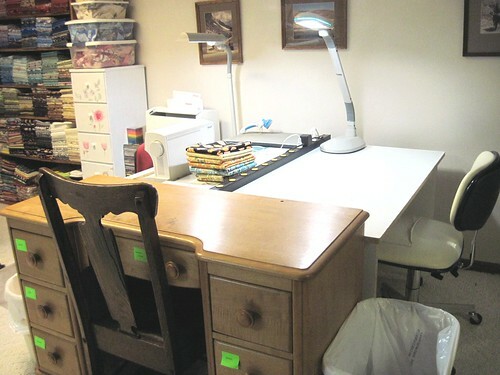 My sewing table has a fold out section that seats another person, and an old vanity minus the mirror is adjacent to the sewing table, creating a space for 3 people to sew and chat. 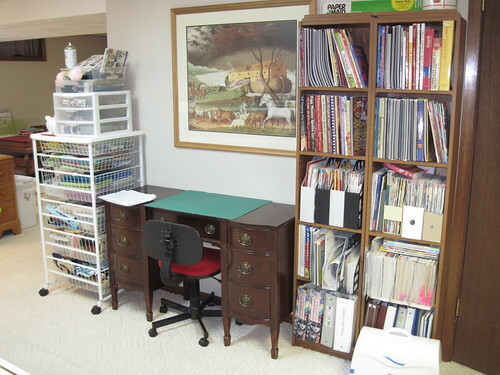 There’s another old vanity against the wall for a fourth person, flanked by that (completely cleaned out and reorganized) wire basket unit and two bookshelves full of quilting books and magazines. Even my desk is clean. All I can say is WOW, oh, WOW. So incredible May I borrow your mom? Looks fantastic, Sandi! Worth the hard work. I’m sure it feels great when you have everything straightened and put how you like it. So much the better to create in. I could definitely do with a tune up, myself! Buttercup really loves her mom-cat. 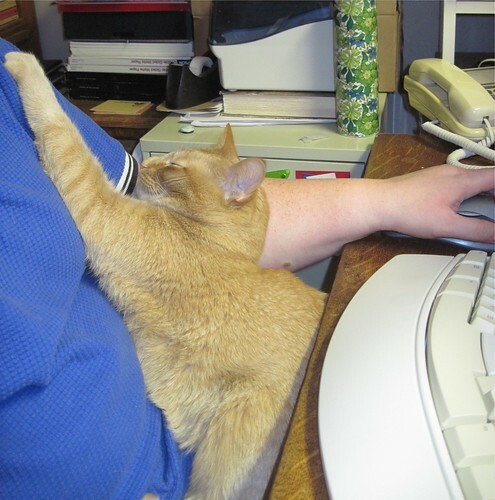 My old cat was the same way. 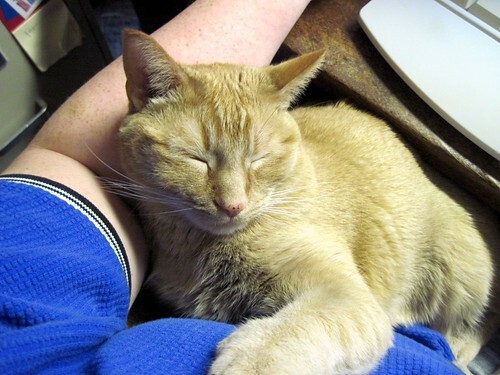 Hissed and ran for cover whenever anybody came to the house, but he was a big old lap baby the rest of the time. Oh wow! 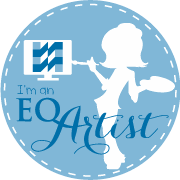 It looks fabulous – as does your quilting. Your room is almost there, & after you catch your breath, there’ll be a burst of creativity! One of the interesting things is that I have “your” Noah’s Ark picture over our mantel. 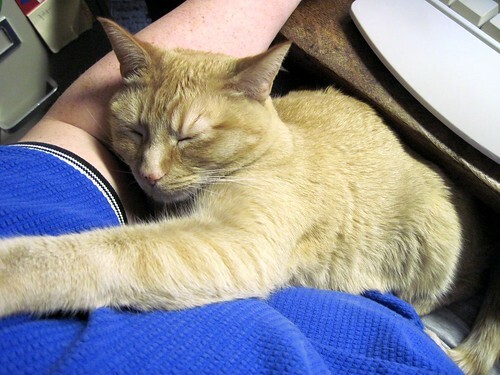 I, also,have your cat – but mine is a female tuxedo who stretches her arm out like that when content. 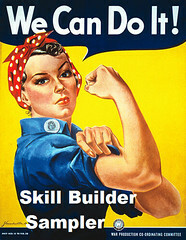 I guess quilters are more alike than different. The room looks so great! Cats are so wonderful. I love how they stretch their arms out to us. Buttercup’s back in her place, and all’s right with the world. I think you definitely need to come to my house. I need some serious help in the organizing department. Let’s just say that your “before” picture has nothing on what mine looks like…. 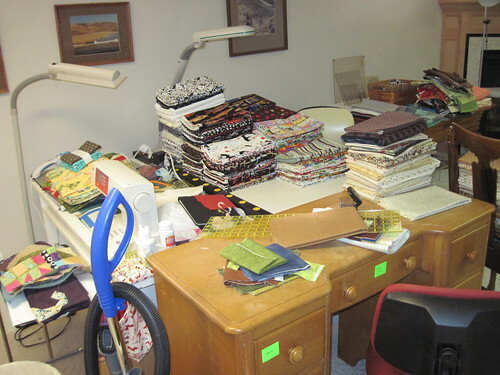 Wow, I thought my sewing room was organised! Your room looks fabulous and I’m so pleased you’ve tried your LA!! I am SO jealous of your stash! 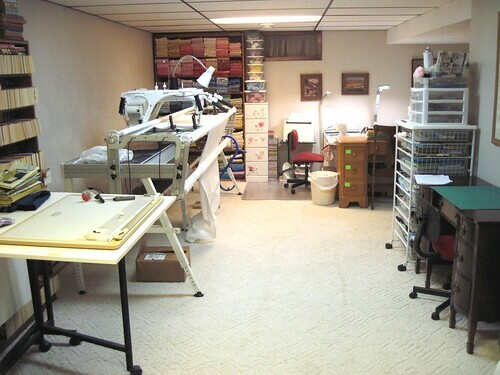 Can I come live in your sewing room? I promise I won’t hiss back at Buttercup. Hey…..I want some of that juice you were drinking!!! WOW, I’m feeling inspired just by looking at your freshened up creative space!!! What a good girl!! Did you treat yourself?? i just drooled all over myself while looking at your stash! it is amazing! what a fun room~! so clean and so organized. 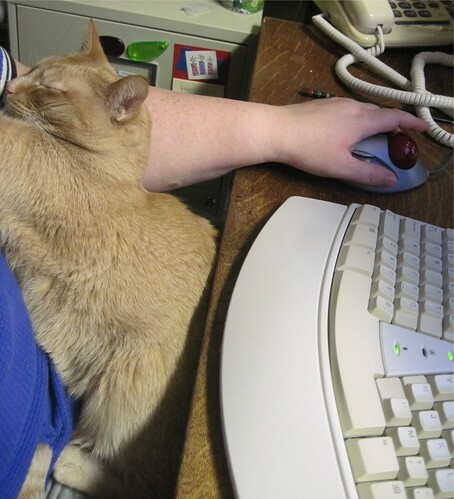 i am excited you have started using your long arm. i am still a bit jealous! Yea! It looks beautiful. 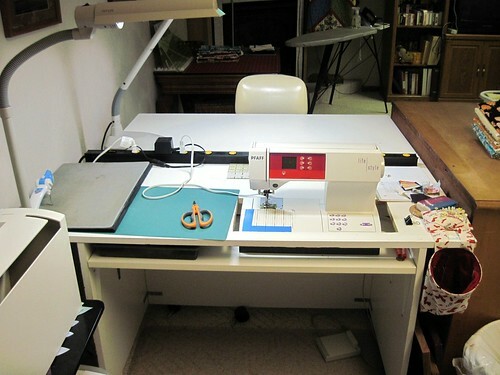 If only I lived closer I would come over and sew with you. 🙂 Thanks for sharing more of you! I like your organization. I plan to do something like yours. Wow, very nice space! Thank you for sharing your system, both here and at Within A Quarter Inch. I am going to try your folding and stacking system. I’m going to need to get some shelves. I’m kind of excited about getting organized, and I can’t believe I just typed that sentence! Wow, just saw this and it’s awesome! 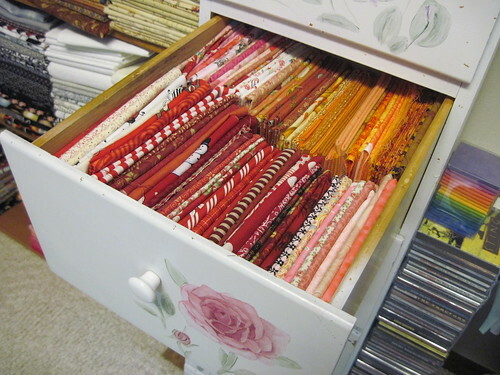 I have to keep my fabric in dresser drawers because of the dust so I forget what I have. My cats (down to 5) do the same thing. Had always wondered if one of those front baby carriers you see new mother’s using would work for the cats. It would give us more freedom if they would stay in it. I love your room, but I also loved the music – I ordered SeeSaw CD!!! Thanks for that.